Background: There is paucity of data on heart failure (HF) in the Gulf Middle East. The present paper describes the rationale, design, methodology and hospital characteristics of the first Gulf acute heart failure registry (Gulf CARE). Materials and Methods: Gulf CARE is a prospective, multicenter, multinational registry of patients >18 year of age admitted with diagnosis of acute HF (AHF). The data collected included demographics, clinical characteristics, etiology, precipitating factors, management and outcomes of patients admitted with AHF. In addition, data about hospital readmission rates, procedures and mortality at 3 months and 1-year follow-up were recorded. Hospital characteristics and care provider details were collected. Data were entered in a dedicated website using an electronic case record form. Results: A total of 5005 consecutive patients were enrolled from February 14, 2012 to November 13, 2012. Forty-seven hospitals in 7 Gulf States (Oman, Saudi Arabia, Yemen, Kuwait, United Gulf Emirates, Qatar and Bahrain) participated in the project. The majority of hospitals were community hospitals (46%; 22/47) followed by non-University teaching (32%; 15/47 and University hospitals (17%). Most of the hospitals had intensive or coronary care unit facilities (93%; 44/47) with 59% (28/47) having catheterization laboratory facilities. However, only 29% (14/47) had a dedicated HF clinic facility. Most patients (71%) were cared for by a cardiologist. Conclusions: Gulf CARE is the first prospective registry of AHF in the Middle East, intending to provide a unique insight into the demographics, etiology, management and outcomes of AHF in the Middle East. HF management in the Middle East is predominantly provided by cardiologists. The data obtained from this registry will help the local clinicians to identify the deficiencies in HF management as well as provide a platform to implement evidence based preventive and treatment strategies to reduce the burden of HF in this region. While numerous observational studies have focused on patients with HF in the developed world (predominantly western countries), very little is known about HF in the developing World, especially from the Middle East, except for a few individual-country studies. , To date, there have been no large prospective multinational studies of HF in the Middle East. To this purpose, researchers in 7 countries from the Gulf Middle East, namely, Oman, Saudi Arabia, United Arab Emirates (UAE), Qatar, Bahrain, Yemen and Kuwait, under the patronage of the Gulf Heart Association, initiated a multinational multicentre prospective observational AHF survey based on cases admitted to various hospitals in these countries. In the present report, we describe the rationale, design, methodology and hospital characteristics of patients from the Gulf acute heart failure registry (Gulf CARE). To identify targets for improving quality of care, reducing morbidity and mortality, and lowering the cost of managing patients with HF. First, to describe the etiology, precipitating factors, demographics, clinical characteristics, management and outcomes of patients admitted with AHF. Second, to study the length of hospital stay, hospital readmission rates over 3 month and 1-year period as well as mortality (in-hospital, 3 months and 1 year) of patients admitted with AHF. Third, to generate data that can be used to compare the findings in the Gulf with other parts of the World and finally to identify deficiencies and determine adherence to published guidelines for HF management. Gulf CARE is a prospective, multinational multicenter registry of patients admitted with the diagnosis of AHF in 7 Middle Eastern Gulf countries. It was designed to compile a large clinical database on the clinical characteristics, management, and outcomes of patients hospitalized for AHF across the Gulf countries. Data are collected on episodes of hospitalization beginning with point of initial care, throughout hospitalization, in addition to 3 month and 1-year follow-up. Recruitment in the study started from February 14, 2012 and ended on November 13, 2012. This was preceded by a pilot phase of 1 month in November 2011. The registry continued to follow-up patients at 3 months and 1 year. Institutional or national ethical committee or review board approval was obtained in each of the 7 participating countries, and all patients provided informed consent. Each patient was given a unique identification number to prevent double counting. The study is registered at clinicaltrials. gov with number NCT01467973. Males and females >18 years of age, admitted to the participating hospitals with the admission diagnosis of AHF were included in the registry. AHF was defined according to the ESC as rapid onset of symptoms and signs secondary to abnormal cardiac function and included: (i) symptoms (dyspnea at rest or on exercise, fatigue, tiredness, ankle swelling), (ii) signs (tachycardia, tachypnea, elevated jugular venous pressure, pulmonary rales, pleural effusion, hepatomegaly, peripheral edema), and, (iii) objective evidence of structural or functional abnormality of heart at rest (third heart sound, murmurs, cardiomegaly, abnormal echocardiogram, raised natriuretic peptide concentration). AHF was further classified as either acute decompensated chronic HF (ADCHF) or new-onset acute HF (de novo AHF) based on ESC guidelines. ADCHF was defined as worsening of HF in patients with a previous diagnosis or hospitalization for HF. New-onset AHF (de novo AHF) was defined as AHF in patients with no prior history of HF. Patients with HF who are discharged from the emergency room without admission were excluded. Patients transferred from non-registry hospital and those in whom informed consent could not be obtained were also excluded. Patients whose final diagnosis was not HF were excluded from the final analyses. The registry identified 49 hospitals in 7 Middle Eastern Gulf countries: Oman, Saudi Arabia, Yemen, Kuwait, United Arab Emirates, Qatar and Bahrain. Hospitals were chosen from different geographical locations representing different populations of a particular country as well as different types of hospitals (university or non-university hospital and secondary or tertiary care center) in each country. For each participating hospital, data were collected using hospital survey form regarding the type of hospital, population covered, number of beds, availability of coronary or intensive care unit (CCU/ICU), availability of echocardiography, cardiac catheterization and surgical facilities including device therapy, and whether AHF patient care was provided by general physicians or cardiologists. Hospitals were classified as community hospitals (<200 beds), University hospitals and non-University teaching hospitals (>200 beds). Follow-up data were collected at 3 months and at 1 year from the date of enrollment. Three months follow-up was carried out telephonically, concentrating mainly on hospital readmission/s for HF and mortality. One-year follow-up was carried out telephonically in two thirds of patients and by clinic visit in one third, in whom additional data on vital signs, New York Heart Association class and medications were collected. If a patient was transferred to a non-Gulf CARE institution, then the patient was censored at the time of transfer, but 3-month and 1-year follow-up were done. However, if a patient was transferred to a Gulf CARE institution, then the patient will continue to be followed at the new institution using the unique patient identification number to prevent double counting. Data were prospectively collected on a standardized Case Record Form (CRF) and entered online into a secure study website (http://gulfcare.org/). Each investigator was provided with individual username and password for data entry. Data collection included demographic data, co-morbidities, risk factors, clinical history, symptoms and signs, investigations, medication history (with dosage) including intravenous drugs, in hospital outcome, etiology and precipitating factors for AHF. Where performed, echocardiography and coronary angiogram data along with cardiac procedures like percutaneous coronary intervention (PCI), coronary artery bypass surgery (CABG), device therapy or any cardiac surgery data were collected at admission and/or prior to discharge. All the variables in the CRF were defined (including range provided for numerical data) to standardize data entry and these definitions were incorporated in the on-line CRF to be read by investigators entering the data. To avoid any missing data, most of the variables were made compulsory, so that the CRF could not be saved until all the required data were entered. A clinical research organization was assigned to handle data analyses. A data quality control committee performed an audit of data in one hospital of each country, chosen at random. At these sites, 100% of CRFs for enrolled patients were monitored for source documentation and accuracy. Definitions of data variables in the CRF are based on the ESC guidelines 2008 and the American College of Cardiology clinical data standards 2005. , Some of the important definitions of variables are mentioned below. Diabetes was defined as having a history of diabetes diagnosed and treated with medication and/or insulin or fasting blood glucose 7.0 mmol/l (126 mg/dl) or HBA 1c ≥6.5%. Hypertension was defined as having a history of hypertension diagnosed and treated with medication, blood pressure ≥140 mmHg systolic or 90 mmHg diastolic on at least 2 occasions. Hyperlipidemia was defined as history of dyslipidemia diagnosed and/or treated by a physician or total cholesterol >5.18mmol/l (200 mg/dl), low-density lipoprotein ≥3.37 mmol/l (130 mg/dl) or high-density lipoprotein <1.04 mmol/l (40 mg/dl). Current smoker was defined as smoking cigarettes, water pipe, cigar or chewing tobacco within one month of index admission. Khat chewing was defined as chewing khat plant/leaves (Catha edulis containing cathionine, an amphetamine-like stimulant, which can cause euphoria, hypertension, myocardial infarction, dilated cardiomyopathy) within one month of the index admission. A total of 5005 consecutive patients were enrolled from February 14, 2012 to November 13, 2012. [Table 1] shows hospital characteristics of Gulf CARE registry. A total of 47 hospitals in 7 Gulf States (Oman, Saudi Arabia, Yemen, Kuwait, United Gulf Emirates, Qatar and Bahrain) participated in the Gulf CARE project. The majority of hospitals were community hospitals (46%; 22/47) followed by non-University teaching hospitals (32%; 15/47) and University hospitals (17%). Most of the hospitals had ICU/CCU facilities (93%; 44/47) with 59% (28/47) having catheterization laboratory facilities. About 48% (23/47) of the hospitals had cardiac surgical as well as device therapy facilities. However, only 29% (14/47) had dedicated HF clinic facility. 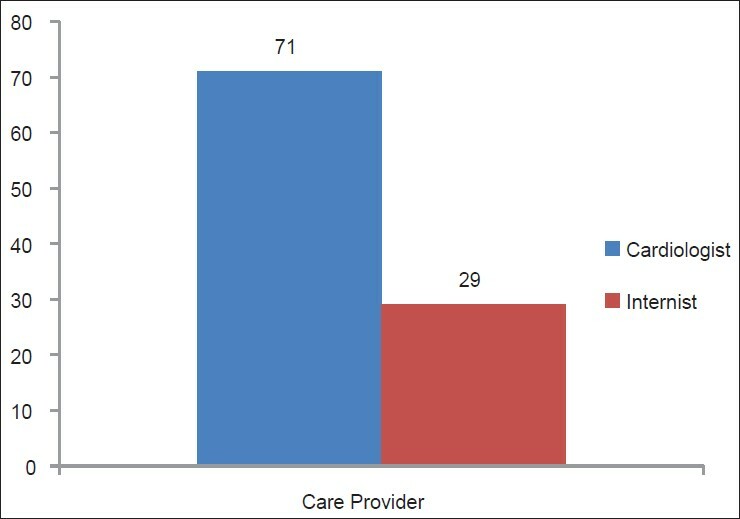 Most patients (71%) were cared for by a cardiologist [Figure 1]. Gulf CARE, for the first time, recruiting patients across many Gulf Middle Eastern countries has been successful in collecting a large database of AHF patients from this region. In fact, this is the first systematically conducted large multinational multicenter study of AHF from Middle East intending to provide estimates of demographics, risk factors, clinical presentation, management and outcome of AHF. The predominant findings from the preliminary analysis of this registry reveal that majority of AHF care is provided by cardiologists, as the main care provider. Majority of hospitals in this registry were community hospitals or non-University teaching hospitals (79%). In this registry, HF care provided by University hospitals were less at 17% when compared to Euro Heart Failure Survey, where 50% of the hospitals were University hospitals. In a study, it was discovered that recommended HF care is less likely in patients who were cared for in smaller community hospitals. Hence, they concluded that programs to improve HF care should specifically target smaller community hospitals, which may be true in the Middle East as well. Cardiologists were the major care providers of HF in the Middle East ensure that proper guideline recommended the evidence based medications and interventions are being followed for the Middle East HF patients. This has significant management implications. In a study, after patient factors were controlled for, care at hospitals without a medical school affiliation, without invasive cardiac capabilities, or in a rural location, as well as not having a cardiologist as an attending physician, was significantly associated with lower rates of left ventricular ejection fraction documentation. Hospitalization at a non-teaching facility was significantly associated with failure to prescribe ACEIs. These issues will be known once further analysis of Gulf CARE registry come out. In this registry, it is observed that there is low rate of HF clinics in the Middle East. This also has therapeutic and prognostic implications. In a study, it has been shown that HF clinicians (HFCs) and general cardiologists appropriately follow guidelines in the majority of cases, but HFCs use medications at higher dose intensity. In another study, HF clinics were associated with reductions in re-hospitalization and mortality in an unselected HF population, independent of whether they are academic-or community-based. This needs to be looked at in this region and need to increase dedicated HF clinics as well as HFCs. The advantages of this registry are many. First of all this registry will provide validated data on AHF demographics from 7 of the Middle East countries. Second, the registry data will give information about the etiology, clinical presentation and the current status of HF diagnosis and management in the region. Third, the data will help in identifying the deficiencies in the care of AHF patients in the region including logistics. Fourth, it will not only provide information about in-hospital mortality, but also about re-hospitalization and mortality at 3 months and 1 year. Fifth, the registry will provide medication data including dosages over 1 year period to know compliance as well as guideline adherence. Furthermore, this registry from the Middle East is expected to provide details of use of device therapy for HF as well as provide data about gaps in evidence-based therapies. It will also be interesting to know the outcomes among AHF patients from this region as we presume it to be different in view of younger age of this cohort from this region as noted from few regional studies. , This registry also gives a unique opportunity to study the effect of Khat (cardio toxic amphetamine) on HF. Finally, this registry will identify targets for improving quality of care, reducing morbidity and mortality, and lowering the cost of managing patients with HF. There are few limitations in this registry analysis. First, inherent to all observational studies, the possibility for unmeasured confounding bias exists. Second, in some of the countries of the Middle East, only a few hospitals took part in the registry. Hence, the results cannot be generalized to that country. Third, Middle East patient population included expatriate patients as well; hence, results may not only represent the Arab population. However, this registry was so designed electronically so that quality of the data collected is accurate and complete with only few missing data. Gulf CARE is the first prospective multinational registry of AHF in the Middle East, intending to provide unique insight into the demographics, etiology, clinical presentation, management and outcomes (both short-term and long-term) of AHF in the Middle East. HF management is predominantly provided by cardiologists. The validated data obtained from this registry will help the local clinicians to identify the deficiencies in the management of AHF as well as provide a platform to implement evidence based preventive and treatment strategies to reduce the burden of HF in this region. Gulf CARE is an investigator-initiated study conducted under the auspices of the Gulf Heart Association and funded by Servier, Paris, France; and (for centers in Saudi Arabia) by the Saudi Heart Association. We thank Hani Altaradi and Kazi Nur Asfina for data coordination in Saudi Arabia. 1. Lam CS, Donal E, Kraigher-Krainer E, Vasan RS. Epidemiology and clinical course of heart failure with preserved ejection fraction. Eur J Heart Fail 2011;13:18-28. 2. Jessup M, Brozena S. Heart failure. N Engl J Med 2003;348:2007-18. 3. Jencks SF, Williams MV, Coleman EA. Rehospitalizations among patients in the Medicare fee-for-service program. N Engl J Med 2009;360:1418-28. 4. Dickstein K, Cohen-Solal A, Filippatos G, McMurray JJ, Ponikowski P, Poole-Wilson PA, et al. ESC Guidelines for the diagnosis and treatment of acute and chronic heart failure 2008: The Task Force for the Diagnosis and Treatment of Acute and Chronic Heart Failure 2008 of the European Society of Cardiology. Developed in collaboration with the Heart Failure Association of the ESC and endorsed by the European Society of Intensive Care Medicine. Eur Heart J 2008;29:2388-442. 5. Hunt SA, Abraham WT, Chin MH, Feldman AM, Francis GS, Ganiats TG, et al., American College of Cardiology, American Heart Association Task Force on Practice Guidelines; American College of Chest Physicians, International Society for Heart and Lung Transplantation, Heart Rhythm Society. ACC/AHA 2005 Guideline Update for the Diagnosis and Management of Chronic Heart Failure in the Adult: A report of the American College of Cardiology/American Heart Association Task Force on Practice Guidelines (Writing Committee to Update the 2001 Guidelines for the Evaluation and Management of Heart Failure): Developed in collaboration with the American College of Chest Physicians and the International Society for Heart and Lung Transplantation: Endorsed by the Heart Rhythm Society. Circulation 2005;112:e154-e235. 6. Writing Group Members, Lloyd-Jones D, Adams R, Brown TM, Carnethon M, Dai S, De Simone G, et al. Heart disease and stroke statistics--2010 update: A report from the American Heart Association. Circulation 2010;121:e46-215. 7. Cleland JG, Swedberg K, Follath F, Komajda M, Cohen-Solal A, Aguilar JC, et al. Study Group on Diagnosis of the Working Group on Heart Failure of the European Society of Cardiology. The EuroHeart Failure survey programme-a survey on the quality of care among patients with heart failure in Europe. Part 1: Patient characteristics and diagnosis. Eur Heart J 2003;24:442-63. 8. Adams KF Jr, Fonarow GC, Emerman CL, LeJemtel TH, Costanzo MR, Abraham WT, et al. ADHERE Scientific Advisory Committee and Investigators. Characteristics and outcomes of patients hospitalized for heart failure in the United States: Rationale, design, and preliminary observations from the first 100,000 cases in the Acute Decompensated Heart Failure National Registry (ADHERE). Am Heart J 2005;149:209-16. 9. Fonarow GC, Abraham WT, Albert NM, Gattis WA, Gheorghiade M, Greenberg B, et al. Organized Program to Initiate Lifesaving Treatment in Hospitalized Patients with Heart Failure: Rationale and design. Am Heart J 2004;148:43-51. 10. Fonarow GC, Adams KF Jr, Abraham WT, Yancy CW, Boscardin WJ, ADHERE Scientific Advisory Committee, Group Study, and Investigators. Risk stratification for in-hospital mortality in acutely decompensated heart failure: Classification and regression tree analysis. JAMA 2005;293:572-80. 11. Brandsaeter B, Atar D, Agewall S, Norwegian Heart failure Registry. Gender differences among Norwegian patients with heart failure. Int J Cardiol 2011;146:354-8. 12. Jonsson A, Edner M, Alehagen U, Dahlström U. Heart failure registry: A valuable tool for improving the management of patients with heart failure. Eur J Heart Fail 2010;12:25-31. 13. Flather MD, Yusuf S, Kober L, Pfeffer M, Hall A, Murray G, et al. Long-term ACE-inhibitor therapy in patients with heart failure or left-ventricular dysfunction: A systematic overview of data from individual patients. ACE-Inhibitor Myocardial Infarction Collaborative Group. Lancet 2000;355:1575-81. 14. Pfeffer MA, Swedberg K, Granger CB, Held P, McMurray JJ, Michelson EL, et al. CHARM Investigators and Committees. Effects of candesartan on mortality and morbidity in patients with chronic heart failure: The CHARM-Overall programme. Lancet 2003;362:759-66. 15. Poole-Wilson PA, Swedberg K, Cleland JG, Di Lenarda A, Hanrath P, Komajda M, et al. Carvedilol or Metoprolol European Trial Investigators. Comparison of carvedilol and metoprolol on clinical outcomes in patients with chronic heart failure in the Carvedilol or Metoprolol European Trial: A randomized controlled trial. Lancet 2003;362:7-13. 16. Hunt SA, Abraham WT, Chin MH, Feldman AM, Francis GS, Ganiats TG, et al. 2009 focused update incorporated into the ACC/AHA 2005 Guidelines for the Diagnosis and Management of Heart Failure in Adults: A report of the American College of Cardiology Foundation/American Heart Association Task Force on Practice Guidelines: Developed in collaboration with the International Society for Heart and Lung Transplantation. Circulation 2009;119:391-e479. 17. Heart Failure Society of America. Lindenfeld J, Albert NM, Boehmer JP, Collins SP, Ezekowitz JA, Givertz MM, et al. HFSA 2010 Comprehensive Heart Failure Practice Guideline. J Card Fail 2010;16:e1-194. 18. Epstein AE, DiMarco JP, Ellenbogen KA, Estes NA 3 rd , Freedman RA, Gettes LS, et al. American College of Cardiology/American Heart Association Task Force on Practice Guidelines (Writing Committee to Revise the ACC/AHA/NASPE 2002 Guideline Update for Implantation of Cardiac Pacemakers and Antiarrhythmia Devices), American Association for Thoracic Surgery, Society of Thoracic Surgeons. ACC/AHA/HRS 2008 Guidelines for Device-Based Therapy of Cardiac Rhythm Abnormalities: A report of the American College of Cardiology/American Heart Association Task Force on Practice Guidelines (Writing Committee to Revise the ACC/AHA/NASPE 2002 Guideline Update for Implantation of Cardiac Pacemakers and Antiarrhythmia Devices): Developed in collaboration with the American Association for Thoracic Surgery and Society of Thoracic Surgeons. Circulation 2008;117:e350-408. 19. Shah B, Hernandez AF, Liang L, Al-Khatib SM, Yancy CW, Fonarow GC, et al. Get With The Guidelines Steering Committee. Hospital variation and characteristics of implantable cardioverter-defibrillator use in patients with heart failure: Data from the GWTG-HF (Get with the Guidelines-Heart Failure) registry. J Am Coll Cardiol 2009;53:416-22. 20. AlHabib KF, Elasfar AA, AlBackr H, AlFaleh H, Hersi A, AlShaer F, et al. Design and preliminary results of the heart function assessment registry trial in Saudi Arabia (HEARTS) in patients with acute and chronic heart failure. Eur J Heart Fail 2011;13:1178-84. 21. Al Suwaidi J, Asaad N, Al-Qahtani A, Al-Mulla AW, Singh R, Albinali HA. Prevalence and outcome of Middle-eastern Gulf and South Asian patients hospitalized with heart failure: Insight from a 20-year registry in a Middle-eastern country (1991-2010). Acute Card Care 2012;14:81-9. 22. Radford MJ, Arnold JM, Bennett SJ, Cinquegrani MP, Cleland JG, Havranek EP, et al. American College of Cardiology, American Heart Association Task Force on Clinical Data Standards, American College of Chest Physicians, International Society for Heart and Lung Transplantation, Heart Failure Society of America. ACC/AHA key data elements and definitions for measuring the clinical management and outcomes of patients with chronic heart failure: A report of the American College of Cardiology/American Heart Association Task Force on Clinical Data Standards (Writing Committee to Develop Heart Failure Clinical Data Standards): Developed in collaboration with the American College of Chest Physicians and the International Society for Heart and Lung Transplantation: Endorsed by the Heart Failure Society of America. Circulation 2005;112:1888-916. 23. Heidenreich PA, Zhao X, Hernandez AF, Yancy CW, Fonarow GC. Patient and hospital characteristics associated with traditional measures of inpatient quality of care for patients with heart failure. Am Heart J 2012;163:239-45. 24. Havranek EP, Wolfe P, Masoudi FA, Rathore SS, Krumholz HM, Ordin DL. Provider and hospital characteristics associated with geographic variation in the evaluation and management of elderly patients with heart failure. Arch Intern Med 2004;164:1186-91. 25. Asghar H, Rahko PS. Quality of heart failure management: A comparison of care between a comprehensive heart failure program and a general cardiology practice. Congest Heart Fail 2010;16:65-70. 26. Howlett JG, Mann OE, Baillie R, Hatheway R, Svendsen A, Benoit R, et al. Heart failure clinics are associated with clinical benefit in both tertiary and community care settings: Data from the Improving Cardiovascular Outcomes in Nova Scotia (ICONS) registry. Can J Cardiol 2009;25:e306-11. 8 Myocardial reverse remodeling: how far can we rewind?